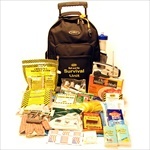 We have 4 options available - select a 1 person survival kit up to a 4 person. Each kit comes in a deluxe emergency backpack and is great for your home, work or auto! This survival kit was designed using advice from experts in the emergency preparedness industry. It follows guidelines given by government agencies and non-profit preparedness organizations. This survival kit was designed to meet the needs of a child 11 years and younger. This quality kit is packaged securely in our Child Deluxe Hikers Backpack. This survival kit was designed using advice from experts in the emergency preparedness industry. It follows guidelines given by government agencies and non-profit preparedness organizations. All items are packed securely in our Deluxe Camo Backpack which contains extra space available for your personal items, a Bright Orange Pull-Out Flag when necessary, and gun straps to free your hands as you travel. Roll and Go Survival Kit (27 piece). This backpack on wheels makes it easy to take your survival gear anywhere. Available for one or two people. This Survival Kit was designed using advice from experts in the emergency preparedness industry. It follows guidelines given by government agencies and non-profit preparedness organizations. This survival kit was designed using advice from experts in the emergency preparedness industry. It follows guidelines given by government agencies and non-profit preparedness organizations. This 2-person deluxe emergency kit has a retail value of $180. For a limited time, we are offering this 72 hour long term food storage kit. It has all of the food and supplies you will need to ke 2 servings per day. It is all packaged in our large Hikers Backpack. This is the ultimate survival kit for those that live in areas that are affected by Hurricanes. All items are packed securely in our 5 Gallon Bucket with Toilet Seat Lid. 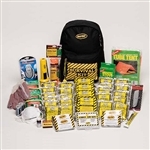 We have survival kits designed specifically for natural disasters, and that's why it's important to be prepared for emergencies such as earthquakes, tornados or hurricanes where your home can lose power, heat and possibly force you evacuate your home. We have survival kits designed specifically for natural disasters, and that's why it's important to be prepared for emergencies such as earthquakes, tornados or hurricanes where your home can lose power, heat and possibly force you evacuate your home. This survival kit was designed using advice from experts in the emergency preparedness industry. It follows guidelines given by government agencies and non-profit preparedness organizations. This 4-person elite emergency kit has a retail value of $220. This Long Term Food Storage Essentials Kit has all of the food and supplies you will need to keep you safe for an extended period of time. There are 44 Long Term Food Storage Meals in this kit that will feed 1 Person for 14 days or 2 People for 1 Week. It is all packaged in our large Hikers Backpack. This survival kit was designed using advice from experts in the emergency preparedness industry. It follows guidelines given by government agencies and non-profit preparedness organizations. This 10-person deluxe office emergency kit has a retail value of $308.